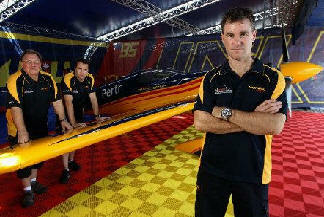 April 12, 2010 - Australia’s Matt Hall has been itching to fly in a Red Bull Air Race in front of enthusiastic fans in his home country for years and the former RAAF fighter pilot can hardly wait for the world championship race in Perth, Western Australia on April 17/18. Hall’s team has worked hard to correct an electrical failure in the season opener last month in Abu Dhabi that left him in a disappointing eighth place. The second-year ace said he was looking forward to putting his season back on the right track in Perth, the second stop on the eight-race calendar. Hall, who was a Royal Australian Air Force officer and spectator at the last race there in 2008, had posted the second fastest net time in the Top 12 round in Abu Dhabi before being forced to retire in the Super 8 round due to electrical problems. It was a bitterly premature ouster for Hall, who was flying well in difficult conditions and poised to grab the second podium of his career. The last remaining tickets are still available for Grandstand seating and Hospitality areas located at Sir James Mitchell Park on the South Perth foreshore. Visit the Tickets & Hospitality section at www.redbullairrace.com or www.ticketek.com.au for further information and bookings.